TECHNOLOGY-All That Matters Today: Are Mobile Devices the future of 'Computing'...? Hello folks, today I just found some more time to stumble the Internet when I came across some great technical post which was related to Oracle suing Google for using some Java code used in its Android OS development. 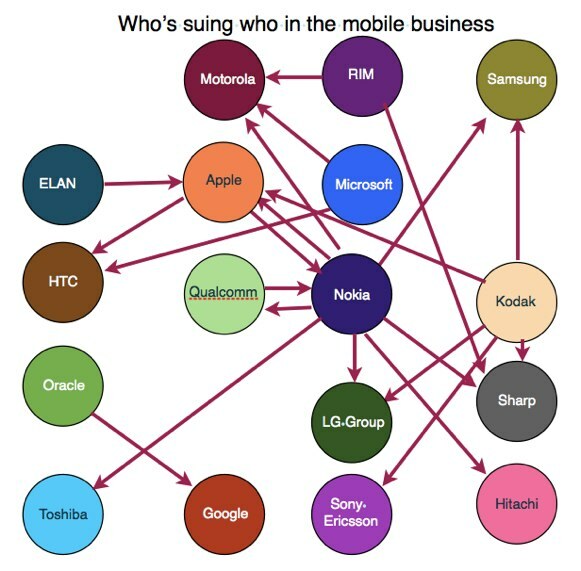 I just found some great pic (or logically speaking 'a directed graph') of companies filing lawsuits against each other & on one another. I was stunned to see that is this something that always happens with the companies. One more thing I pondered about was Are these companies competing each other coz Mobile Device Computing is tomorrow's Computing Era and I believe it is. Take a look at the picture, the strongest player,while talking about Operating System, being at the center of the picture.